…which was how I had found myself on the almost-vanished island below, alone, only to be hauled aloft by a sailor hanging onto a rope ladder dangling from a giant flying ship both held aloft and propelled by…well, propellers. In the bow, the strange craft flew a black flag with a golden sun in the center, one I’d recognized instantly, because I had gone through a Jules Verne kick when I was little girl (at least, that’s how I remember it, although what in my past is real and what contrived, I can’t tell): the flag of Robur the Conqueror, from the novel of the same name, which meant this impossible vessel had to be…yes, there it was, on the dark-blue bow in glistening gold script: Albatross. The Albatross’s hull might have come straight from a sailing ship, except for the absence of a keel—and except for the stubby biplane wings extending to port and starboard. These I presumed were primarily for steering purposes, not to provide lift, since the thing was currently hovering. What held it aloft were seventy-four whirling helicopter rotors, two on each of thirty-seven masts. The downdraft buffeted me as the man in an old-fashioned sailor’s uniform who had pulled me onto the lowest rungs of the ladder looked down at me, jerked his thumb upward, then started to climb. For the first time, I saw he wore earplugs. There is a knack to climbing a rope ladder, which I apparently didn’t have: the thing swayed and bounced as I struggled upward, until I thought I’d either fall off or throw up; but eventually, panting, I reached the top. My rescuer, with the help of another man in an equally old-fashioned sailor’s uniform—honestly, they looked like they’d stepped straight out of a community-theater production of HMS Pinafore—hauled me onto the deck, through an opening in the wire trellis that ringed it in lieu of bulwarks, leaving me sprawled on my stomach. This gave me an unexpected opportunity to closely examine the deck. It wasn’t made of wood; it was a smooth, unbroken expanse of dark-blue…something. What was the Albatross made of? It had been nearly twenty years since I’d read Robur the Conqueror. For some reason “paper” came to mind, but that couldn’t be right, could it…? The sailors—or maybe “aeronauts” was a better term—grabbed my arms and pulled me to my feet. I tried to tug free, but their grips tightened. They half-dragged me aft, beneath the howling rotors—making me wish I had earplugs, too—toward the cabins at the back. Atop the stern-most stood the helmsman, as Pinaforeishly clad as the rest of the crew, inside a glass wheelhouse. Behind him, as at the bow, hung two much larger propellers, vertical rather than horizontal, though only idling at the moment. The whole flying monstrosity was impossible…or was it? Verne had based his flights of fancy on what the engineers and scientists of his time knew, or thought they knew. He’d certainly thought something like this was at least theoretically possible. And from what Karl had told me, the Shaper of this World could actually have altered the laws of physics enough to allow something like this to fly. I’ll ask the Shaper when I see him, I thought, as I stumbled toward the stern cabins (there were others at the bow) between my taciturn escorts, deafened and windblown. Maybe I’m about to. Clearly whomever had Shaped this world had fancied himself master of it, and since this was the Albatross, the airship of Robur the Conqueror, a.k.a. 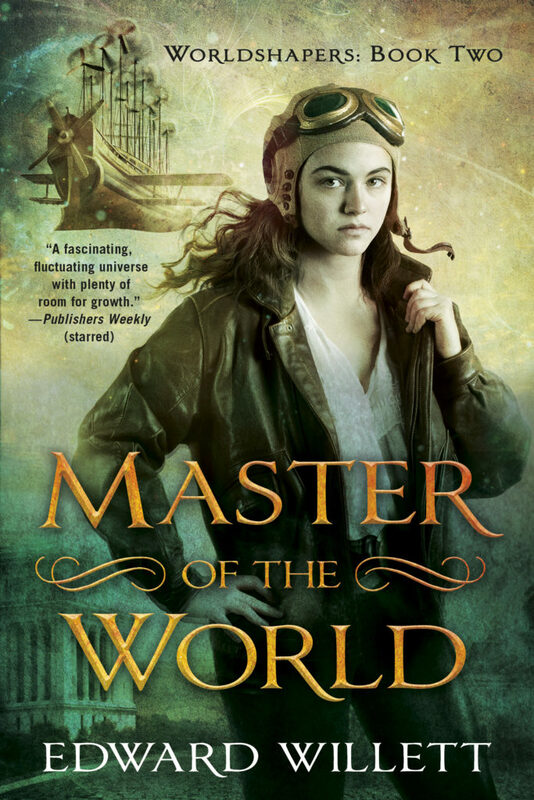 Master of the World (the title of the second novel in which he’d appeared), he had surely set himself up as that Verneian character—supervillain, or superhero, depending (like his better-known counterpart, Captain Nemo) on your point of view. In a way, I was thrilled to be inside a world clearly modeled after Jules Verne’s inventive tales. In another, I was terrified. Karl had not come through the Portal with me. I was alone, and while I knew in a generalway what I was supposed to do to fulfil the quest I’d been unwillingly given—find the Shaper and get him/her to somehow give me his/her hokhmah, so that if/when the Adversary arrived, he could not steal that hokhmah, kill the Shaper, and then reShape this world into another copy of his preferred totalitarian “utopia”—there was one tiny little detail of that process Karl had never spelled out for me: exactly how one took the hokhmah of another Shaper, even if it were freely offered. We reached the only door in the starboard side of the stern cabins. The aeronaut who had first hauled me onto the rope ladder pulled it open; the other propelled me through it. I found myself in a short hallway, its walls the same strange, dark not-wood of the deck, with doors to left and right and another at the far end that presumably led to the port side of the vessel. Just past the right-hand door, stairs led up, probably to the glass wheelhouse over our heads; a little farther down the hall, stairs led down, beneath and parallel to those climbing up. The noise had dropped precipitously: very impressive soundproofing had clearly been built into this version of the Albatross. As I recalled, it hadn’t been needed in the book version—the whirling of the blades had been soundless (Verne never having heard a real helicopter in action). Apparently, if the Shaper had bent the laws of physics, he hadn’t bent them that much. Apparently, politeness was limited to the lesser ranks. My guard ignored me, instead tugging me to the center of the corridor and tapping on the door that presumably led into the aft-most cabin. “Enter,” said a deep voice. My guard slid the door open, stepped back, and indicated I should go through. I took a deep breath, clenched hands suddenly inclined to tremble, and strode firmly around the corner and into the cabin beyond. It looked…well, exactly like you might imagine the captain’s cabin on one of Verne’s science-fictional vessels should look: luxurious-late-19th-century-ship’s-cabinish, with comfortable couches and chairs, hooded electric lamps illuminating sculptures and paintings (one of which looked like the Mona Lisa—how did that work, exactly?) and a sizable collection of leather-bound books in a floor-to-ceiling bookcase, which took up most of the bulkhead through which I’d entered. Four portholes, two to port and two to starboard, and big panes of glass in the windowed stern poured natural light into the cabin. The aft windows also showed a view of the sea—no land in sight, I noted—and the inner halves of the idling stern propellers. The captain of the Albatross sat at a desk made of the same dark not-wood as the deck, the bright sea-reflected light streaming through the windows behind him turning him into a featureless silhouette. He stood as I hesitantly approached, and I abruptly revised my estimate of his size: the man was huge, easily as big as the guy Michelangelo’s David had crushed back in my world, less than an hour ago by my inner clock. At least it appeared to be roughly the same time of day here as it had been on the island I’d just left, so maybe I’d be spared jet…er, Portal lag. Which totally had to be a thing. My heart was pounding but I wasn’t going to let this giant, whose face I couldn’t even see, put me on the defensive. “You must be Robur,” I said, as boldly as I could manage. “You do?” My heart leaped. Karl got through after all! “It…does?” This doesn’t sound good. Dark lord. So, it’s that kind of world. I felt like I’d just picked up a square in what was likely to be a rather large bingo card featuring Shaper stereotypes. Although “Prince Dakkar” would seem an odd persona for the Shaper to assume. The fact I couldn’t remember a character by that name would seem to indicate he hadn’t been a major figure in Verne’s books. (The fact I couldn’t simply pull out my phone and run an Internet search on the name was downright infuriating.) Why would a Shaper clearly enamored of all things Verne choose to play someone minor? Maybe they are, a voice suggested. Maybe there’s a kind of universal translator at work…a TARDIS/Star Trek kind of thing. Dammit, you’re my conscience, not the Doctor, I told myself. Shut up. The captain was clearly losing patience with me, and the side over which I could be hurled to the sharks—not that I’d survive the fall, so there was a small mercy—was not far away. I swallowed and tried to focus. The captain studied me for a moment. “Sit down,” he finally said. Figuring it would be harder for someone to grab me, haul me out of the cabin, and throw me over the side if I had a chair to hold onto, I gladly complied, sinking onto the plush red cushion of the nearest. (It was wicker, clearly a nod toward saving weight, although considering all those books in the bulkhead behind me, there were limits to how much weight the captain felt obliged to save.) My legs felt a bit wobbly, anyway. The captain rounded his desk, pausing at a glass-fronted cabinet to pull out a crystal decanter containing a yellow liquid, and two rather large glasses. He sat down in the other chair that faced his desk, turned it so it faced me, put the glasses on the desk, pulled the stopper out of the decanter with his teeth, sloshed a sizable portion of liquid into each glass, reinserted the stopper with his teeth, took one glass, nodded at the other, and then sat back in his chair and studied me as he sipped from it. Holy hell, what is this stuff? It had a million different herbal flavors, all tucked inside one god-almighty envelope of alcohol. I’d never tasted anything like it. But did I mention the alcohol? That was what I really wanted at that particular moment, and the fact the drink burned as it went down was only proof (about eighty-proof, by my estimation) it contained that all-important ingredient. I coughed only a very little, daintily putting the back of my hand to my lips as I did so, and kept looking at the captain. Like the crewmen, he wore an old-fashioned naval uniform, though of course his was dark blue and featured gold braid and even those shoulder-pad things with tassels on them, whatever they’re called. The fact he was dark-skinned and wore a rather large gold loop in each ear-lobe rather undercut the HMS Pinafore thing, though. All he needed was an eyepatch and he would have made a great extra in a Pirates of the Caribbean movie. “We were ordered here by Robur to investigate the Mysterious Island…” (in his voice, I could hear the capital letters I had likewise decided to apply to the strange landmass) “…after ships reported its existence. We had barely arrived when it began to crumble—suspiciously fortunate for you. Oh, there must be some other possibilities, I thought, but the truth was, I couldn’t bring any to mind. “Shaper of the next world over” didn’t seem likely to contribute anything useful to the conversation. Well, that’s a nasty little piece of folklore, I thought. Whoever shaped this world, Dakkar or Robur, I was beginning to take a serious dislike to them. “You thought I was a spy at first,” I said. Is that good or bad? I wondered, then wondered why I was asking myself, since I had no clue. “Is that good or bad?” I repeated out loud. My dislike of the as-yet-unmet Shaper of this world deepened further. …or throwing pots, I thought, and felt a wave of homesickness, for Eagle River, for my shop, for the Human Bean, for my boyfriend, Brent, for my Mom in Appleville, for my best friend, Aesha. Who was dead, or perhaps had never existed. Mom, I had Shaped to forget me. Brent, the Adversary had Shaped to forget me (or else he’d been too cowardly to acknowledge knowing me when I’d called, in which case, good riddance). “You can’t go home again,” the old saying has it. In my case, it was literally true. There was no going back, there was only going forward, and if I didn’t have Karl to guide me, which for the moment I didn’t, then all I could do was plunge forward myself, however blindly, in the hope of somehow getting closer to my goal. My head swam and I felt a little sick, and I didn’t think it was from my two swallows of strega. “Captain Nebuchadnezzar Harding-Smith, at your service,” he said. He actually bowed his head and clicked his heels as an accompaniment to the introduction. Nebuchadnezzar? Neb, the freed slave who was the faithful servant of Cyrus Harding in Verne’s novel The Mysterious Island? (Come to think of it, that island also crumbled into the sea, although in its case it was due to a massive volcanic eruption.) I remembered the character Neb well, but this man was clearly not a servant. Also, where did that “Smith” come from? Oh, Internet, how I miss you. “Do you know a man named Cyrus?” I ventured. “A wild guess,” I said. Captain Harding-Smith went to the door of the cabin, opened it, and spoke in a low voice to the man who had brought me there. Then the captain turned to me. “Mr. Pencroff, my first mate, will show you to your quarters.” He indicated the open door with a sweep of his arm. I took a deep breath, found I was gripping the back of the wicker chair so tightly the weave was impressing itself into my palm, forced myself to release it, and strode with what I hoped was an air of confidence to the door. This time, Mr. Pencroff did not take me out onto the deck. Instead, he took me to the end of the hall, to the downward-leading steps. He indicated I should descend, so descend I did, to find myself in a hallway running fore and aft, with sliding doors every few feet. To my left—aft—the corridor ran, I guessed, about a third the length of the hull, ending in another door that presumably led to the hold. “That’s me,” I said. “Lucky as they come.” I pushed past him into the space beyond. Less than half the size of the captain’s cabin overhead, it shared with it large glass windows aft. There were also portholes to port and starboard, with a cot beneath each. A table and two wicker chairs graced the space directly in front of the window. An ornately woven oval rug of red, blue, and gold covered the middle of the floor. Electric lamps, currently unilluminated, hung next to each of the portholes. I turned to say “thank you” to Pencroff, but he was already sliding the door closed. It clicked shut, clicked again as he locked it…and then I was alone.